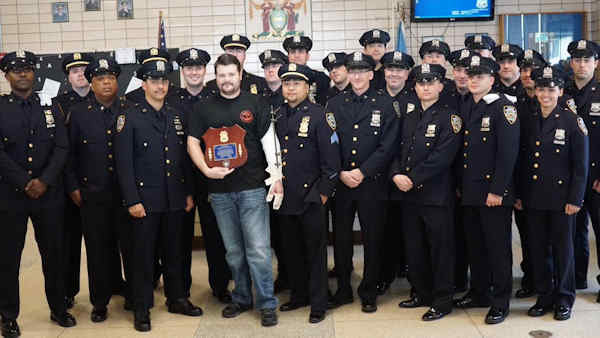 PHILADELPHIA (WABC) -- Officers with the NYPD's 17th Precinct traveled to Philadelphia Wednesday to show support for a cop who was shot during an ambush there earlier this month. Philadelphia Police Officer Jesse Hartnett was released from the hospital last Friday, three weeks after he was injured in an ambush shooting in West Philadelphia, allegedly by a man who says he did it "in the name of Islam." Hartnett sustained three gunshot wounds to his left arm during the attack. "Significant injuries he sustained that night; It is absolutely amazing he's here," Philadelphia Police Commissioner Richard Ross said. "Probably had he sustained them to any other part of his body, we'd be planning the funeral." Philadelphia police tweeted about the visit and offered thanks to the NYPD. Video of the attack on Officer Hartnett drew global attention, triggering literally hundreds of well-wishing greetings via cards and telegrams. "You saw all those cartons come out full of nothing but letters and cards from people young and old, from East Coast to West Coast to Great Britain," Ross said. Hartnett is now home in Delaware County, where he is asking for complete privacy.